Is 2015 the year HTML5 reigns supreme? O ver the past decade those of us working in technology have witnessed the explosion of mobility and the corresponding wave of mobile apps. Some of the first mobile apps built on Nokia’s Symbian OS were difficult to use and limited by network speeds, but gave us a glimpse of what was to come. At the time, the world of apps consisted of Personal Information Managers that were limited to: email, calendar, contacts, and sometimes extras like stock market and weather info. As the “Big Three” (Verizon, AT&T, & Sprint) began to make the jump from basic 2G networks optimized for voice, to 3G networks that were better able to handle data via mobile broadband, developers could begin to leverage the increased bandwidth speeds and processing power of 2nd generation devices such as: iPhone 3G, Motorola, and HTC Droid. No longer were users restricted to bloat-ware and stock apps developed by cell phone manufacturers, but rather mobile devices could now do anything an app developer wanted to put up on the market. At the core of the matter, it seemed to be a slam-dunk for HTML5. It’s cheaper and easier to deploy, flexible enough to work across multiple mobile OS’s, devices and browsers, and developers only need to “code” once. However, one place where HTML5 fell short, and this is what some developers feel is the most important aspect of a successful app, was user experience. The reality is that most, if not all, apps use HTML5 in some fashion, but when it comes to the UI/UX, native will win every time – at least for the moment. If Apple has it’s way, 2015 may just be the year of HTML5. With the release of the WKWebView, a new API to Apple’s Safari browser said to boost hybrid app performance up to 4x, developers may now leverage the enhanced functionality built into iOS8 for a richer and more responsive UI/UX. 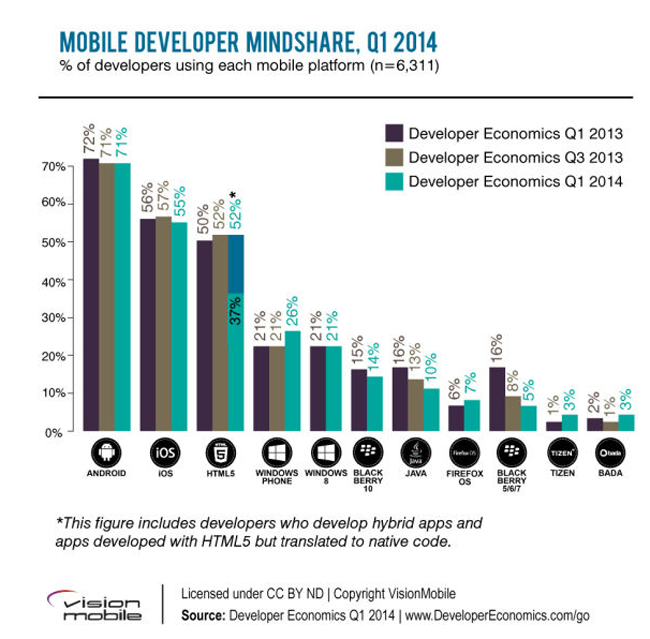 Native apps take the prize but, mobile is an evolving space so as for 2015, stay tuned. How do you think this chapter in mobile development will play out? Let us know in the comments.